Cade Lautt has opened up 2018-2019 in a big way for St. James. Garden City, ranked second in 6A behind Derby, won the prestigious Battle of the Best tournament in Pine Creek, Colo. It marked the first time the Buffs had captured the competition. GC finished 7-0 and was the only Kansas school in the tournament. In pool play in the dual format, Garden City went 54-15 in matches. In the first four preliminary duals, GC faced little resistance outside of a 48-32 win versus Pueblo East. On Saturday, Garden City defeated host Pine Creek, 68-12. In the championship triangular, Garden City matched Falcon and Ponderosa. GC beat Ponderosa, 42-36. The Buffs had a big edge in depth. GC filled five weights than Ponderosa couldn’t and earned forfeit wins in all five. The Buffs forfeited just one weight class to Ponderosa. Versus Falcon, GC won 41-28. Freshman 220-pounder Tyler May and junior 195-pounder Alex Rodriguez both did not lose a match at the competition. May is not, while Rodriguez is fifth at 195. Four wrestlers went 6-1: Alex Herrera (113), Silas Pineda (120), Diago Hernandez (126) and Jacob Holt (132). In the state rankings, Herrera is fourth, Pineda stands second, Hernandez is fifth and Holt is first. 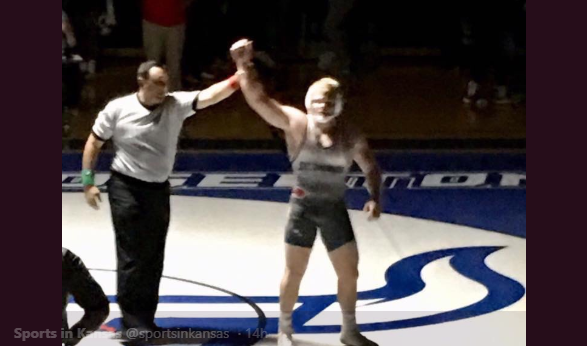 Goddard and Manhattan led the Kansas teams at the 15-squad Gardner-Edgerton Invitational. Southeast Polk (Iowa), Allen (Tex.) and Broken Arrow (Okla.) were the top three squads, followed by Goddard, Manhattan, Dodge City and Mill Valley. Goddard finished with 191 points, while Manhattan had 134.5. Manhattan is the No. 3 team in the Class 6A rankings with eight ranked wrestlers, many whom placed in the top-six at the high level tournament. Easton Taylor (4-1) is third at 113 and lost only to Goddard’s Kamden Huneycutt en route to fifth place. Senior Jacob Mitchell is third at 132 and finished sixth in the competition with a 3-2 record. Junior Darius Island-Jones – sixth ranked at 145 – was sixth with a 2-2 mark. Senior Bubba Wilson is No. 1 at 160 and went 3-1 with a runner-up at 160. He lost only to Southeast Polk’s Cade DeVos, 5-2, in the final. Quincy Saddler is fourth at 170 and went 4-1 with a second-place showing. He fell to Goddard’s Troy Fisher in the title. At 220, senior Christian Schlepp, third in the classification, took second in the tournament with a 4-1 record. St. James’ Cade Lautt, the No. 2 wrestler in 5A, beat Schlepp in the final by fall in 3:07. Dodge City and Mill Valley flip-flopped spots from the preseason. DC stands fifth, and Mill Valley is sixth. At 285, DC’s Evan Darville matched his No. 1 state ranking with a dominant run through the competition. He had three wins by fall in 47 seconds or fewer, earned an 11-8 decision and a 14-5 major decision. DC freshman Damian Mendez is ranked second at 106. He was fourth at the tournament with a 3-2 mark and both losses to out of state opponents. Junior Anthony Mariche, second-ranked at 113, took third in the tournament. For MV, junior Zach Keal is top-ranked at 120 and was the team’s top finisher. He was second with a 4-1 record. Keal captured his third match in sudden victory. In the final, he fell to Jared Hill of Broken Arrow (Okla.), 3-2. For No. 1-ranked Goddard at the G-E Invitational, Jason Henschel (4-1) took second at 113 pounds and lost in the championship match against Broken Arrow’s Jackson Cockrell in sudden victory. Henschel had dominated his four previous matches with falls in less than two minutes. He is top-ranked in 5A. Jace Fisher was 4-1 and took fifth at 138 pounds. He is ranked fourth in Kasnas. Cayleb Atkins, ranked fourth, went 4-0 with a championship at 145 pounds. In the final, he defeated Southeast Polk’s Ryan Strickland, 7-0. Nolan Craine (4-1) took fifth at 152 pounds, and Trevor Dopps (4-1) was third at 160. Craine is third, Dopps first in the rankings. At 170, top-ranked Troy Fisher (5-0) captured the title in five wins by fall, including a championship victory in 61 seconds versus Manhattan’s Quincy Saddler. At 182, Cayden Atkins (3-1) was third, and Trenton Willert (3-1) was fifth at 220. Both Atkins and Willert are fourth in its respective weight classes. Arkansas City, ranked second in 5A behind Goddard, won the Ark City Wayne Jackson wrestling duals. Maize, ranked third in 5A, was second. AC defeated Maize in the first place match, 38-27. Winfield beat Emporia, 35-33, for third and fourth. Blue Valley Southwest, ranked No. 5 in 5A, won the season-opening Burlington Wildcat Duals. BVSW bumped up a spot from a preseason sixth ranking. The competition featured 12 squads, including two BVSW squads, and a bevy of ranked teams. Maize South was second, Burlington third and Washburn Rural fourth. Burlington is fourth in 4A, WR is fourth in 6A. Eureka was No. 2 behind Scott City in 3-2-1A in the preseason and now could be considered the top contender since SC has moved to 4A. BVSW defeated Maize South, 58-18, in the championship. Burlington beat WR, 47-30, in the final. At the Valley Center, Great Bend enjoyed a strong showing with 192 points. Bishop Carroll was second at 156.5, and Newton stood third at 151. The showing had some slight changes in the back half of the 5A top-10 rankings. In the preseason, Newton, Carroll and Great Bend were 7-8-9, respectively. This week, Newton is seventh, Carroll has fallen out of the rankings and GB remains ninth. Jeffrey Spragis (5-0) earned the title at 138, along with Gage Fritz at 145 and Alex Randolph at 152. Great Bend had multiple wrestlers take second, including Wyatt Weber at 106, Drew Liles at 120, Carsyn Schooler at 126, Skyler Burkes at 126, George Weber at 138. Weber and Spragis actually both advanced to the final, but Weber won by forfeit. Cade Lautt of St. James has been in four matches and has had four pins. He won the Gardner tournament in the first tournament of the year. In that tourney featured the number one big class teams from the state of Texas (Allen), Oklahoma (Broken Arrow), Kansas (Goddard), Nebraska (Skutt Catholic) and 6A defending champion Olathe North. His older brother, Clay, who was a mutliple time state champion, is a sophomore wrestler at North Carolina at 174-pounds. Scott City, the defending 3-2-1A state champions, bumped up to 4A after the alpha weigh-in. SC was preseason ranked first in 3-2-1A. SC had its first meet without longtime coach Jon Lippelmann, who retired after 33 years as head coach and 38 with the program. SC is now third in 4A behind Marysville and Pratt. Pratt and Scott City both opened at the Pratt Invitational and finished 1-3 in a close contest. Pratt had 163.5 points, Ulysses tallied 161 and Scott City had 158.5. For Pratt, sophomore Devon Weber, ranked third at 106, won with a 4-0 mark. At 126, freshman Koda Dipman also finished 4-0 with a championship, including a win by fall in 92 seconds in the final. At 152, top-ranked Kadence Riner, a senior, dominated with a 4-0 finish. He had two falls, including one in the championship, and a technical fall in the semifinals. At 160, Jadon Koehler, ranked second, went 4-0 with a crown. Caden Blankenship took second at 182 when he lost to Holcomb’s Tanner Johnson in the final, 8-6. For Scott City, Brandon Roberts was second at 120 when he lost, 8-4, to Andale’s Hector Serratos. Kaden Wren was top-ranked in 3A at 138 and was immediately bumped to No. 1 in 4A. He went 3-0 with two falls in a combined 2:31 and a 13-1 major decision victory. At 145, Theron Tucker was not ranked at 3-2-1A and is sixth at 145. He finished 3-0 with a title, including a 2-1 decision versus Andale’s Dawson Chavez in the championship. Wyatt Hayes was preseason first at 170 at 3-2-1A and is first in 4A. He rolled through the tournament with a bye and wins by fall in 21, 24 and 21 seconds. Cale Goodman and Kyle Sherwood each finished 3-1 and in third place at 182 and 220, respectively. Minneapolis made a significant surge in the rankings. The Lions opened the season outside of the top-10 but vaulted to fifth after it captured the nine-team Osborne tournament with 182 points. Smith Center was second at 153, and Hill City third at 147. Smith Center remains fourth in the team rankings. Minneapolis features multiple ranked wrestlers. Freshman 106-pounder Gage Carlson is sixth at 106 pounds and went 5-0 with a win by fall in the championship. Senior Austin Roth is sixth at 120 and took second with a 4-1 mark. Senior Tristan Hauck is third at 138. Hauck went 5-0 and won all of his matches by fall. His longest match came in the championship when he defeated Hill City’s Bryce Ashbaugh in 1 minute, 38 seconds. Layne Wilton went 4-1 and took second at 170. Senior Tyson Villalpando, a returning state runner-up, is No. 1 at 182 pounds. He had three matches and a win by injury default and his longest match lasted 3:17. At 195, Keyon Baccus (4-1) took second. Chance Korinek (4-0) earned first at 220. For SC, Jackson Pickney took second at 106 pounds. Colton Shoemaker went 5-0 and won at 113. Jaden Atwood went 4-0 and won at 145. Jacob Conrad (4-1) took second at 160, as did Brell Spiess (4-1) at 182. At Hoxie, Colby, ranked seventh in 3-2-1A in the preseason, captured the meet with 168 points. Norton was second at 139.5, and Hoxie took third at 108, five points ahead of Oakley. Aschenbrenner is ranked third at 113, and Booi is fourth at 182. For Norton, Camdyn Unterseher (3-0) captured the title at 126 pounds. At 170, Cole Amlong, who was preseason third at 160 pounds, was second with a 2-1 mark. He lost to Oakley’s Morgan Rains, 3-0, in the championship. At 195, Judson Wiltfong earned the title with a 5-0 mark and a 3-0 win versus Oakley’s Lane Shirley in the title. At 220, Hayden Wiltfong, who was preseason second at 195, rolled with three victories by fall, including 38 seconds in the final versus Plainville’s Ryan Junkermeier. Hoxie had fewer total numbers than Colby and Norton, but had plenty of quality. Colby had 13 wrestlers, Norton nine and Hoxie eight. At 120, Drew Bell finished 3-0 and in first place. At 132, Dylan Weimer, the preseason No. 3 at 120, moved up and went 4-0 for the title. Both won by fall in the finals. At 145, Aidan Baalman was 3-0 with a 16-12 win versus Plainville’s Ben Hansen in the title. At 160, Hoxie’s Dayton Porsch, a three-time defending state champion and top-ranked, rolled through his three wins with victories in 3:22, three minutes and 1:03 in the final against Cimarron’s Tate Seabolt. Girls’ wrestling continues to grow in Kansas with multiple nationally ranked wrestlers. Signs point to the sport being sanctioned in Kansas soon, perhaps even for next year. McPherson, with coach Doug Kretzer, and his daughter, Mya, have played a significant role in the sports’ growth. One of the key early season girls’ tournaments took place in McPherson. The 120-pound division had two groups, 120 and 120A. At 120, Buhler’s Sydney Warkentin scored a key win against Grace Mundy of Burlingame to take first. Mundy was second and Buhler’s Rachel Harmon was third. Warkentin went 4-0 with all wins by fall in under a minute. At 120A, Buhler’s Payton Warkentin also took first, followed by McPherson’s Kaleigh Marbut. Warkentin finished 4-0 and had three wins by fall, and a 7-6 decision versus Marbut. At 126, Mya Kretzer cruised in a four-girl bracket with victories by fall in 23 and 45 seconds. At 132, Burlingame’s Gianna Culbert was first with two wins by fall in 3:56 and 36 seconds. At 138, McPherson’s Haley Schafer finished 4-0 and defeated Douglass’ Devon Cokeley, 10-3, for first and second place. McPherson’s Morgan Jones won at 145, and Canton-Galva’s Taryn Norstrom earned the 152 title. At 160, Fredonia’s Mason Claibourn collected wins by fall in 38 seconds, 33 seconds, 1:32 and 1:46. Junction City’s Elisa Robinson (170-182) won her two matches, 14-7, and 21-6. In addition to Mya Kretzer, Culbert, Claibourn and Robinson are ranked nationally (top-20).